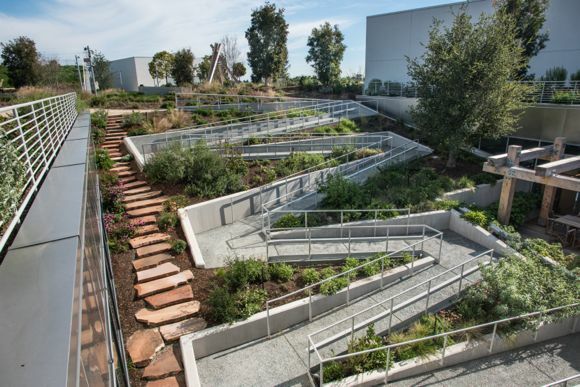 When touring Facebook’s nine-acre rooftop garden, it’s not always easy to look at the plants. The 360 view is spectacular, particularly this winter with the Bay Area hills so green, not to mention the patchwork formed by the shore meeting the Bay at high tide. That is not to imply the garden is uninteresting. On the contrary, there is a lot to take in, both plant and structure wise. Ninety percent of the garden consists of native California plants. The 350 trees are a mix of evergreens and deciduous, with a variety of flowering types. The path system that wraps around the roof is one-half a mile long. There are breakout spaces for people to meet at frequent intervals. Resident and migrant birds share the space with employees. 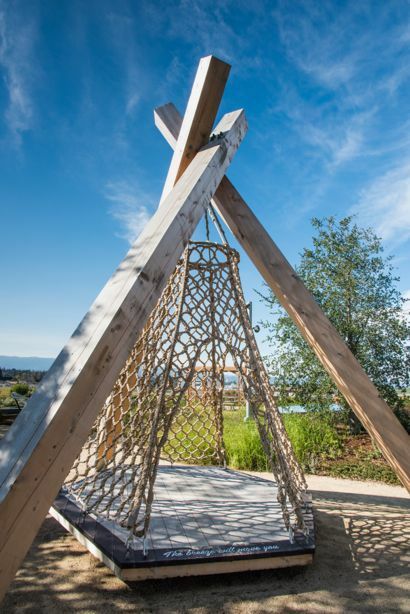 The paths and gardens are intersected by a number of teepees designed by Gehry as well several art installations from artists Smith Allen, Jay Nelson and Evan Shively.